Thanks to the remote control that comes included in the purchase, the unit allows for changing the settings without you having to get up from your couch. The built-in aroma box enables you to use it as an aroma diffuser. Removing the water reservoir might be a bit tricky. 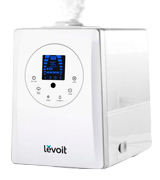 If you want one of the better options the market can offer you, the Levoit LV600HH ultrasonic humidifier can be your best bet. 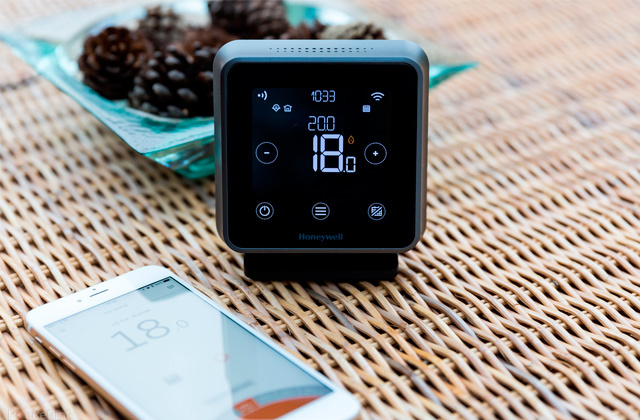 The device boasts a wide functionality and quiet operation and comes with a generous space container enabling it to generate mist up to 36 hours. A great option for large spaces. A decent device that performs the functions of a purifier, moisturizer, ionizer, nebulizer and aroma diffuser. It is safe for children, unlike warm mist humidifiers, and whisper-quiet in operation. It also features an automatic shut-off function. The power indicator is a bit too bright and might get annoying in the night time. If you value not only functionality but also shape and form, the Aennon Cool Mist will be your best choice. Among the models on the list, it is the only one that comes with LED and mist control. A perfect moisturizer for improving the quality of your sleep. 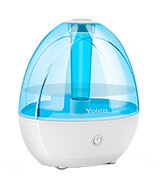 The Yoleo Ultrasonic humidifier is best suited for small spaces, offices, bedrooms, etc. It is children-friendly and whisper-quiet at 32dB noise level. Despite relatively small water capacity, it can work continuously for up to 28 hours and automatically shuts off when the tank empties. The internal connectors might rust if you spill water while filling the reservoir. If you are looking for a simple but smart and relatively cheap humidifier for medium-sized rooms, the Yoleo Ultrasonic is the one to go with. The model is compatible with the Vicks VapoPads so you can fill your room with both a pleasant mist and a nice smell at once. Even a full tank lasts just a few hours. If you want a humidifier to not only keep the air clean but also relieve your body and alleviate symptoms of various illnesses, the Vicks VH750 is an amazing find. It can be used to spread a pleasant smell, increase humidity in the room, or spread medical rubs to improve your health. An astute medically-useful buy for a thrifty shopper. This cool mist humidifier comes with a cleaning brush, which makes cleaning of the base unit and the water tank easier and more effective. The brush is small and doesn't take up much storage space. The instructions aren't very helpful. 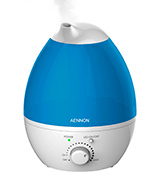 The ANSIO 94352 Ultrasonic Cool Mist Humidifier is a no-frills appliance for small and medium-sized rooms. It has an On/Off button only and offers two misting speeds. It's pretty basic yet it does its job decently. Waking up coughing, with a stuffy nose, isn’t fun, especially if you have children. For them, more than for anybody else, the quality of air is very important. So if you want to protect your family and children from the negative effect of dry climate and make your living space more comfortable - consider the Levoit LV600HH. 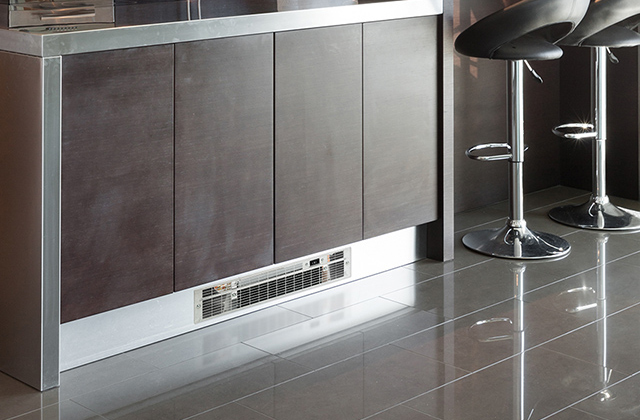 This humidifier can make a big difference in the quality of your surrounding environment. Though this model looks very hi-tech, using it is very simple due to its straightforward controls. You have three intensity settings in cold and warm modes and about 20-36 hours of runtime for misting. 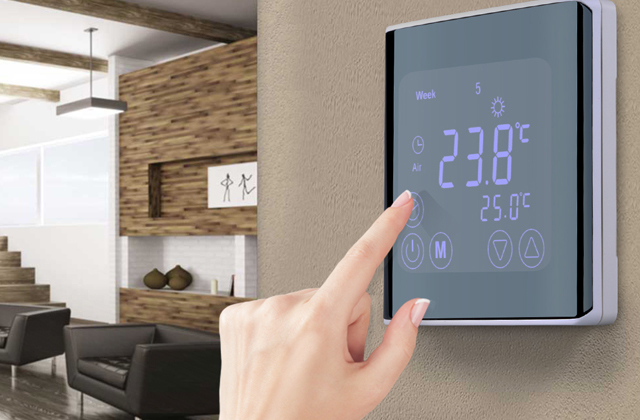 Choosing the settings is easy and can be done either via a sensitive control panel or with a remote control that comes together with the unit. If you've ever had one of those mornings where you just want to snuggle up instead of getting out of bed, the remote controls are a godsend. Also, you’ve got an auto mode that can automatically disperse the mist depending on the value of humidity level in your room. 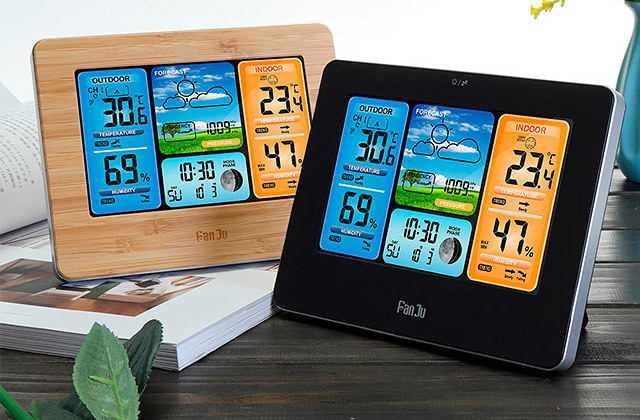 The convenient feature is that you can actually see how humid your room is owing to a built-in hygrometer, and adjust the settings accordingly. This is important as you don't want to overhumidify your home or you might have wallpaper peeling off and wooden doorframes absorbing excess moisture. 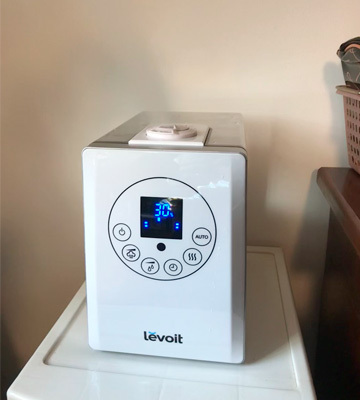 Luckily, the Levoit LV600HH makes the adjustment process easy so you don't run the risk of mixing up the numbers and waking up in a home with dried out air either. With the effective coverage of 70 square meters, the Levoit LV600HH is the perfect choice if you want to moisturize a large sitting room, office, or your whole house. That kind of coverage might be a tad of an overkill for big rooms but it's best to overdo it than to leave your home with dry air. This model has a large reservoir with 6L capacity and can produce up to 500 ml of mist per hour. Plus, you have an option to add your favourite essential oils to the aroma box at the base of the unit if your goal is not only to kill lingering bacteria but also fill your house with pleasant odours. Just be careful when taking out the reservoir for a refill, it's lodged pretty snugly in the body of the device. If there's some water left in it, you risk pulling too hard and spilling it on yourself and the humidifier itself. 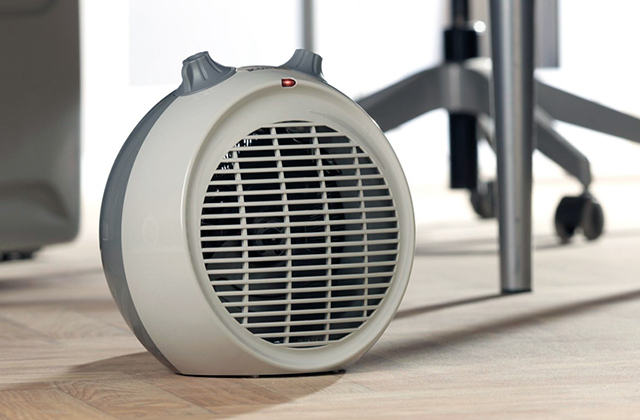 In all, among the humidifiers we reviewed, this one is the best choice for large spaces. It’s also the most appropriate choice for those who’re suffering from nasal problems and can’t sleep well. If you've noticed that your place lacks humidity, what you need is a good humidifier. And the Aennon CoolMist can be the right choice for you. 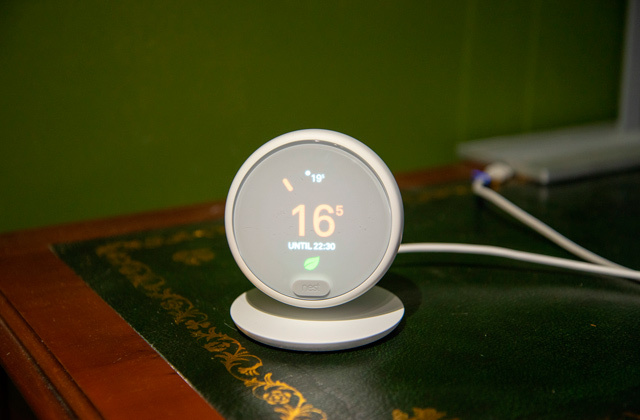 The device doesn't raise the temperature in the room, stays cool, and produces only cool mist, which makes it a safe option for nurseries and bedrooms where your children sleep. Even if your kid happened to tip it over, it wouldn't cause any harm or burns, as the unit doesn't produce heat at all. 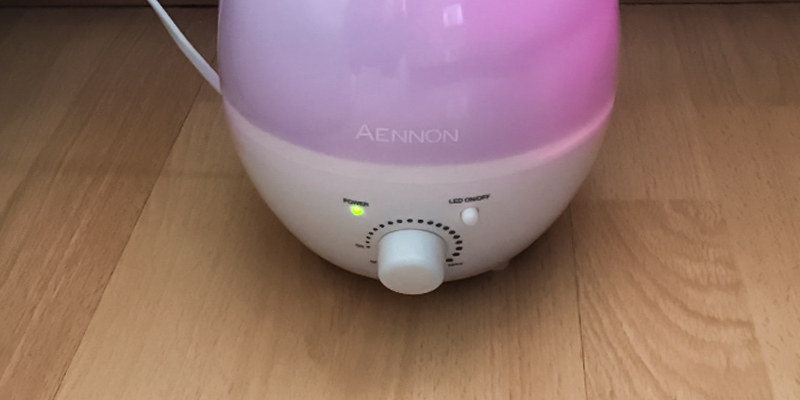 Placing the Aennon CoolMist in the room where your family sleeps will not only improve the quality of air but also help moisturize your skin, improve physical condition and mental health, as well as help relieve many unpleasant cold symptoms such as running nose, flue, cough, etc. You will also be able to use the Aennon CoolMist as a nightlight. It comes with 7 colourful LEDs so you can choose the best one to create a soothing and calming atmosphere in your room. The elongated shape and stylish design of the Aennon Cool Mist humidifier blend perfectly well with just about any interior. Set it in your living room, office, bedroom or nursery, select the mist flow, and enjoy the soothing atmosphere of your house. Thanks to the built-in diffusion option, you can use it with essential oils, too. Just add a few drops of your favourite oil and add fragrance to the air of your room. People suffering from respiratory conditions often use the Aennon Cool Mist as a nebulizer. They add medicine instead of oils and inhale it with the steam. The Aennon Cool Mist can also serve as an ionizer helping reduce unpleasant odors, bacteria and fungi in the air. 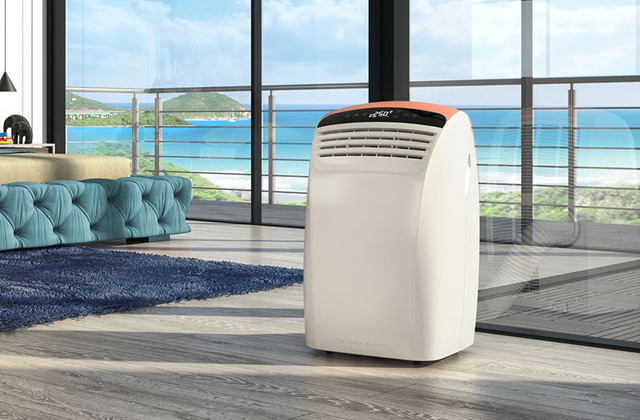 Thanks to the 2.8-litre capacity, the Aennon Cool Mist humidifier can work continuously for solid ten hours, which despite being not the longest operating time is sufficient for humidifying the air for the length of the whole night. When the reservoir empties, the device stops working automatically. The Aennon Cool Mist is good not only at keeping the air moist, it's also efficient at reducing unpleasant odours and killing bacteria in the air. Simply rotate the nozzle 360 degrees to humidify the air in the direction you need. 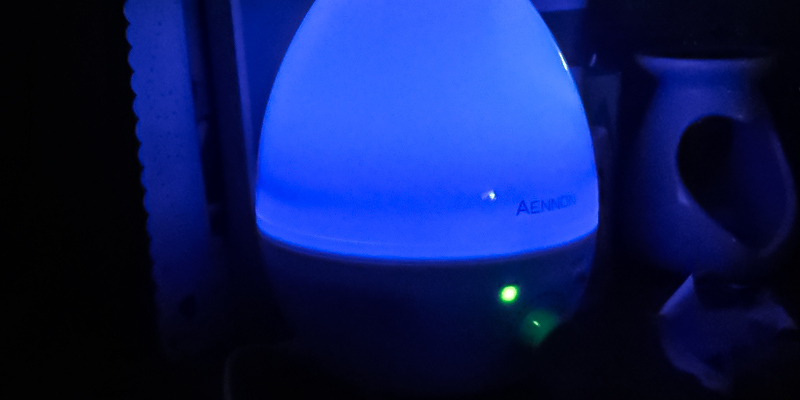 One other thing you will surely like about the Aennon Cool Mist humidifier is its whisper-quiet operation. Even if you place it next to your bed, it won't interfere with your sleep. If you want to help the symptoms of dry skin, running nose, and itchy eyes, then it's high time to buy a proper humidifier and add moist to the air of your house. With the Yoleo Ultrasonic humidifier, you will notice the difference in the air quality right away and will feel much better after a couple of days of using it. The Yoleo Ultrasonic humidifier has a nicely-shaped and stylish design that will look great in any room decor. It is equipped with a 1.8-litre capacity tank that allows it to produce sufficient amount of steam to cover small- to medium-sized room or office and keep moisturizing it for up to 28 hours. After one humidifying session, the air in the room will become not only moister but also clean of dust and pathogenic bacteria. Use it daily and take care of your health. 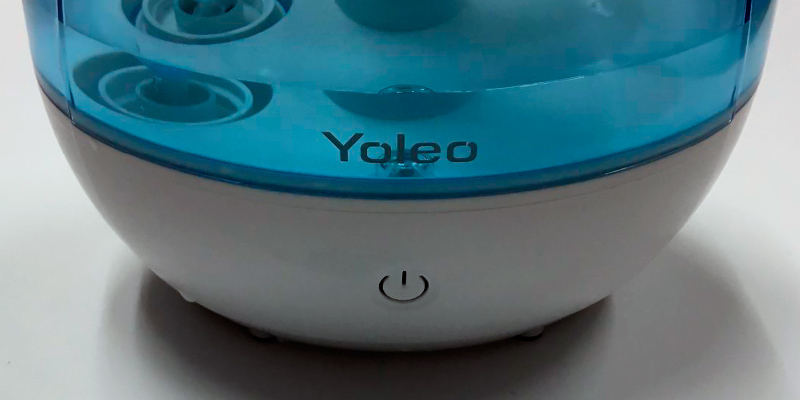 Thanks to the ultrasonic technology, the Yoleo humidifier boasts whisper-quiet operation, which means, it can be safely placed in nurseries, bedrooms, and offices without disturbing people around. 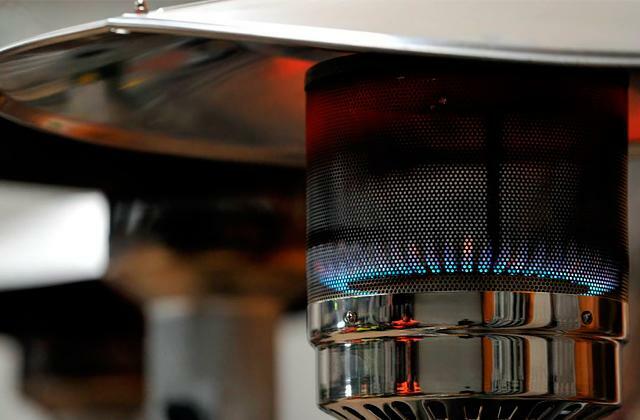 Due to the same technology, the unit can lower your electricity bills. 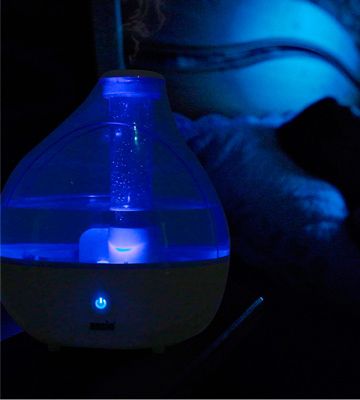 The Yoleo Ultrasonic humidifier has a soothing night light for sleep. However, this feature can be switched off if you don't like sleeping with the light on. Plus, the humidifier is equipped with an auto-off control that will turn the device off in case you fall asleep when the water level drops low. So just fill the tank and go to bed or do your things without worrying that you have to be watching it all the time. What else is also good about the Yolo Ultrasonic humidifier is that it is easy to control. The device has two speed modes: low and high. With just one touch of a button, you can choose the level of mist and direct the mist spray around 360° degrees. For better performance, it is recommended to keep the unit clean wiping its housing and nozzle at least once a week. If there is a need to fill the tank with water, follow our simple instruction. 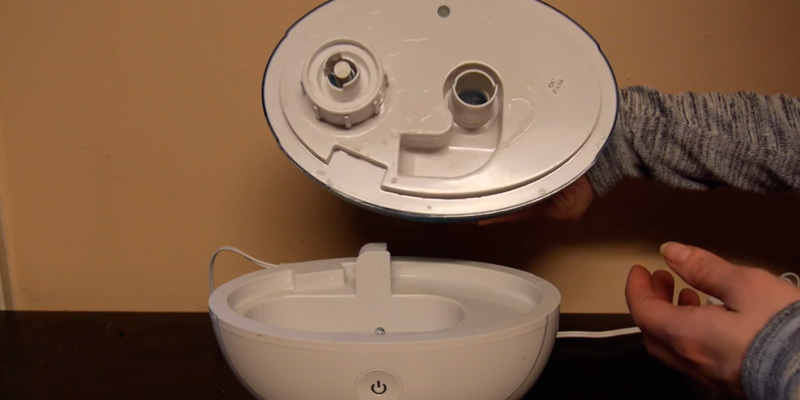 At first, detach the tank from the base of the humidifier. Then turn the tank over and unscrew the lid. Next, pour cold, clean water into the tank and screw the lid back. But do it very tightly to avoid the water leaking from the tank. Finally, plug the unit in and set a program. The Yoleo Ultrasonic humidifier is ready to work. Keeping your body healthy is a constant job but you can probably take care of yourself just fine. However, if you have a baby or a small child, they need to have clean and nourishing air in the room too. 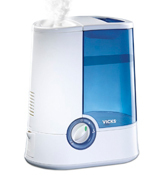 So if you want a compact yet powerful humidifier for a bedroom (be it yours or your child’s) - get the Vicks VH750. 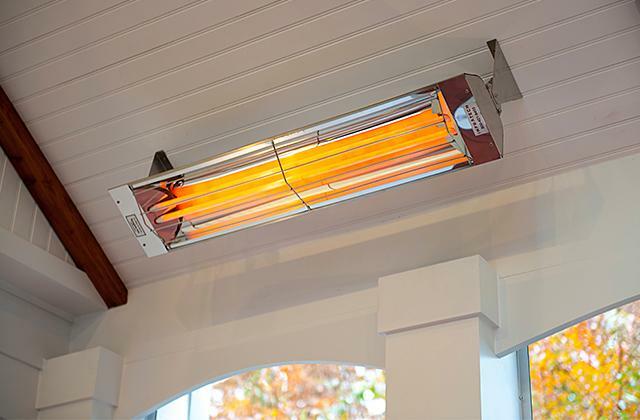 This model has a built-in light and works extra quietly so you can leave it on for the sweltering summer nights without your sleep being disturbed at all. We recommend turning down the mist generation to low for the night, though, as you don’t want to get the humidity excessively high. There’s sadly no way to check as the model doesn’t have a humidistat. You can get a hygrometer, though. It's not precisely the same but it will help to keep the humidity level precisely where you want it to be as long as you're willing to spend time setting up the device properly. Though that shouldn’t be too tough considering you only have to fiddle with the 2 settings modes: High and Low mist intensity. What matters a lot for keeping the humidity level in check, though, is the automatic shut-off function. 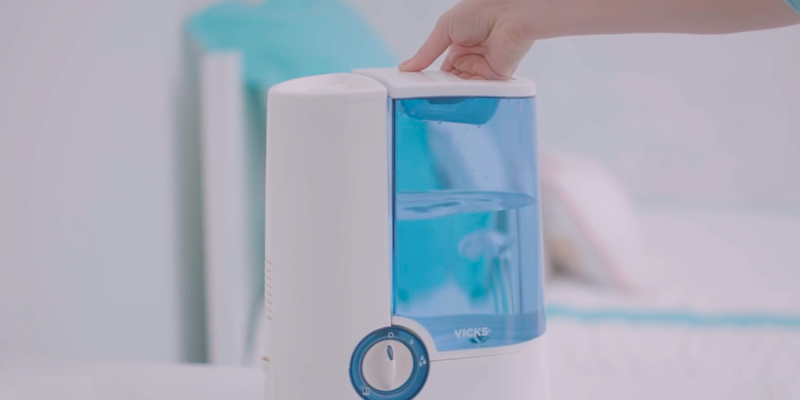 You can set up the Vicks VH750 to stop working once the desired level is reached so you don’t wake up to a heavy humidity after a good night of sleep. It’s not perfect, of course, but it’s still a bonus for those who are forgetful and might leave the device on when going off to work. The feature that makes this device unique is its compatibility with the Vicks VapoPads. A menthol-scented one even comes with the purchase, you can leave it in the vaporizer and wait as it’s filling your room with a pleasant smell. The top of the Vicks VH750 also has a cup in which you can pour medicine. For example, you can use inhalants and other medication to ease the symptoms of a sore throat or asthma. Sadly, while the smell from the VapoPads will linger for a long time, we can’t call the reservoir here equally long-lasting. Although the 3.6-litre capacity seems quite good, the water runs out fast and you’ll have to refill the tank nearly every nine hours. It’s not much of a hassle as the reservoir slides right out but it does mean this model won’t be as effective at keeping humidity up while you’re away at work or leave home for a vacation. So if you or your family members want a humidifier that’s good for more than just keeping the air clean but curbing illnesses and boosting your health, the Vicks VH750 is an excellent choice. If you need a simple, frills-free humidifier, the ANSIO model might be a solid fit. It can help you create a healthy environment in small and medium-sized rooms. It has a neat, nicely-shaped design that will blend with any interior. The humidifier is fitted with a 1.5-litre tank that enables it to produce moisture for up to 16 hours. 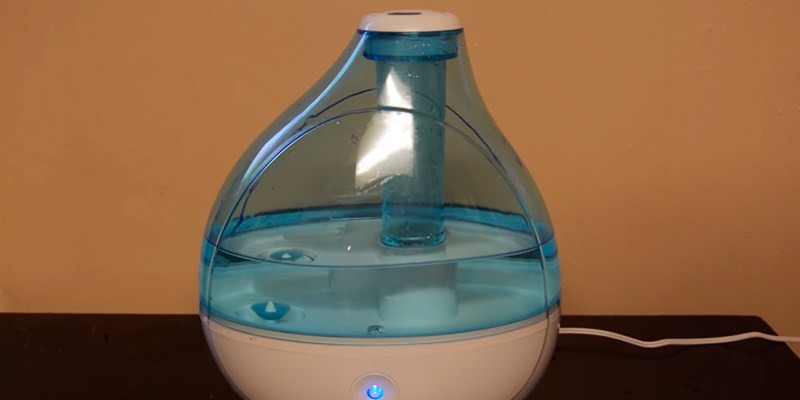 Take note though, this humidifier must be used only with distilled water and it's prohibited to add any essential oils, which may appear to be a disadvantage for some (unless you have an oil diffuser). If, however, you don’t need any aromas and just want the humidity control, this is a good option and here’s why. The beauty of the ANSIO 94353 is its simplicity. Unlike sophisticated and expensive models, this one has neither dials nor extra controls - there's only one "power" button on the front panel. The mist speed is adjusted by simply turning the nozzle, which is quick and convenient. The simple design is doubly important considering how poorly written the manual is here. It’s not going to explain much at all and you might as well figure things out for yourself. What else adds scores to the ANSIO 94353 is that you get a special cleaning brush with your purchase. With this brush, it will be much easier to clean the main unit and prevent the build-up of limescale. We highly recommend doing this maintenance regularly as it keeps the air quality high and prevents unwanted emissions from the humidifier. It’s particularly vital for people with allergies or respiratory diseases. Though you might look at the coverage area of 20 m² and scoff, it’s actually quite good because, unlike some of the simpler models, this one does cover the premises evenly. This is achieved thanks to a rotating nozzle that spouts mist in a circle, ensuring that it’s distributed all around the room instead of just drifting onto one side. However, the thing we like most about this humidifier is its whisper-quiet operation, owing to the ultrasonic technology used. You can easily place it on your bedside table and rest assured that it won't disturb you while you sleep. The ANSIO 94353 is ideal for bedrooms. It has a glowing light which can be turned on and off depending on how you like to relax. In all, the ANSIO 94353 is a high-quality product. A proof of this is that it comes with an extended 2-year online warranty. 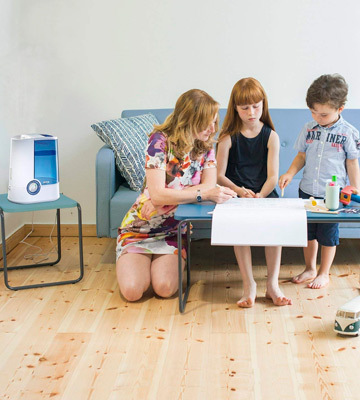 Simple yet reliable, the ANSIO humidifier will soon turn your home into a better place. 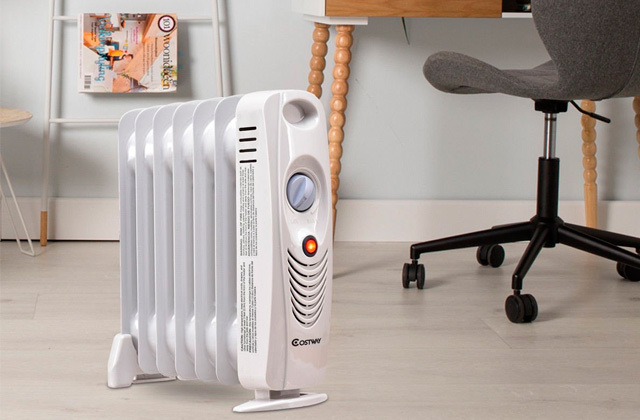 It’s not the most feature-rich option but it’s budget-friendly and compact, taking up little space but making a huge difference for the quality of air in your home. The air in the room is what directly affects our physical and mental health. The optimal humidity in a living room should vary in a range of 40-60% to provide favourable environment for a human being. Too dry air can easily infringe body thermotaxis, dry eye mucosa hard and cause respiratory diseases. Lack of humidity also negatively impacts wooden furniture, parquet and indoor plants. If your place is not well humidified, buying humidifier is the best solution. A humidifier is a special device, designed to moisturise rooms with too dry air. Usually, humidifiers offer some other functions aimed to improve living conditions - they can warm and cool the air, clean it off from harmful impurities, dissipate unpleasant odours, etc. When a humidifier is on, it’s important to keep windows and doors shut otherwise its efficiency will be reduced by times. 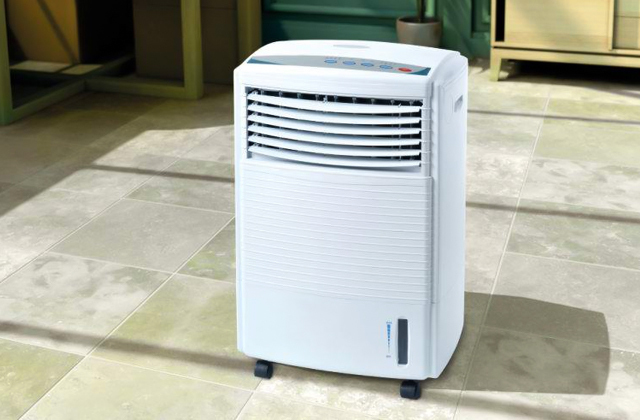 You may also be interested in dehumidifiers, special devices used for solving high humidity problems. Warm mist humidifiers are worldwide spread and simple in use. Their operation is very similar to kitchen kettles. Firstly, they boil the water and then, turning it into vapour, moisturise the room. For preventive effects, one can add some drops of essential oils to the unit and linger the place with fresh, fragrant aromas. In this way, not only will you enjoy beautiful scents but also have proper health therapy. 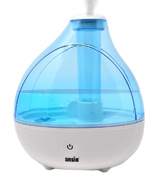 Cool mist humidifiers are also popular. They work by means of cool evaporation from water, a very natural process when water transforms into a gas. Along with air humidification, cool mist humidifiers clean off the air from dust and germs. Such humidifiers are super safe and easy in use and maintenance. 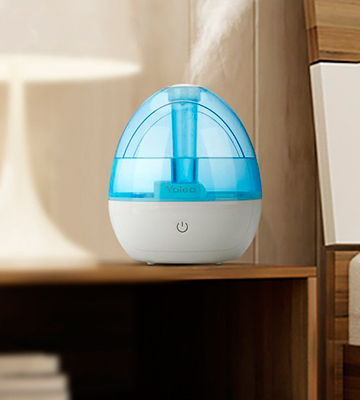 Ultrasonic humidifiers create the fine mist by using vibrations inside the unit. They've got to be paired with cartridge filters in order to remove fine dust impurities from the air. Rather than that, they are the safest humidifiers to use. There's absolutely no risk of burn since the casing is made not to heat. 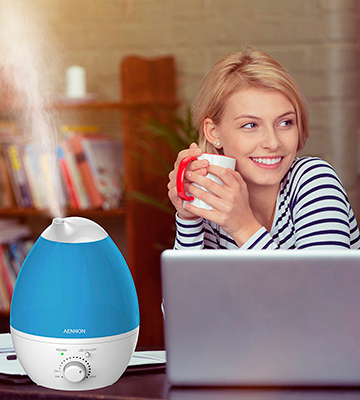 Ultrasonic humidifiers are used to quickly and effectively humidify living rooms. You may also want to check whether the chosen device is equipped with a water filter and humidistat. Most water filters are exchangeable and made of synthetic fibre. Due to their antimicrobial treatment, filters clean the water from all kinds of bacteria, germs, viruses and any admixtures, ensuring that you and your family breath the clean air. Ultrasonic humidifiers come paired with cartridge filters. They humidify the air by turning the water into a fine mist so that you don't need to change them at all. Humidistat is a device used to control the optimal moisture level in your room and save on electricity bills. 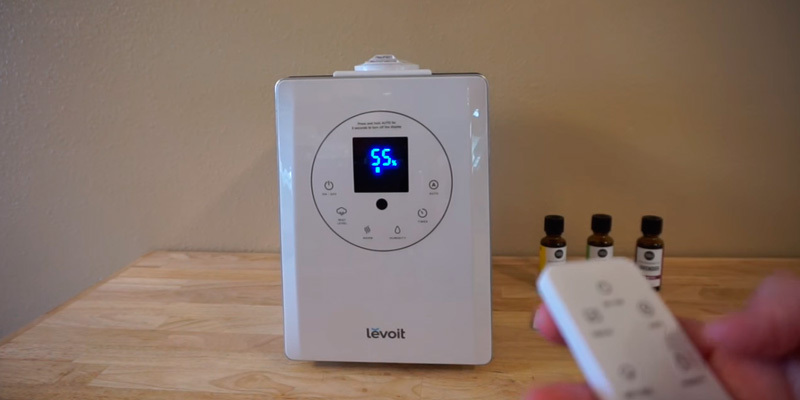 Humidifiers with humidistats automatically shut on and off when the moisture level in the room changes. Using humidifier without humidistat may cause discomfort to keep the right humidity. In addition, make sure to take into consideration the working hours and coverage area of the chosen humidifier. Operation with full water tank should not last less than 12 hours. Otherwise, you'd need to constantly keep an eye on it and refill a reservoir. Since the amount of water that must evaporate to maintain the desired moisture level depends on the area, 3-gallon tanks are more preferable for larger rooms. However, for the rooms of 500-600 square feet, the most suitable capacity would be of 1-1.5 gallons. 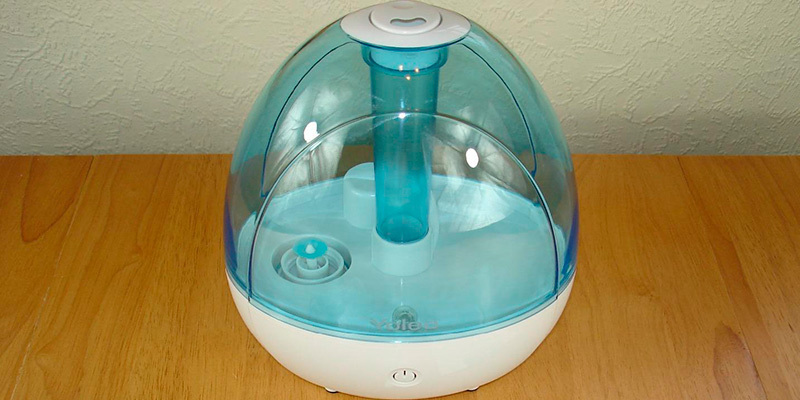 Some humidifiers also have specific extra features that come in helpful in use. Generally, you'll see such common features as automatic shut-off, on/off timer, water indicator, humidistat and variable intensity levels. All these features are provided for users' utmost comfort. 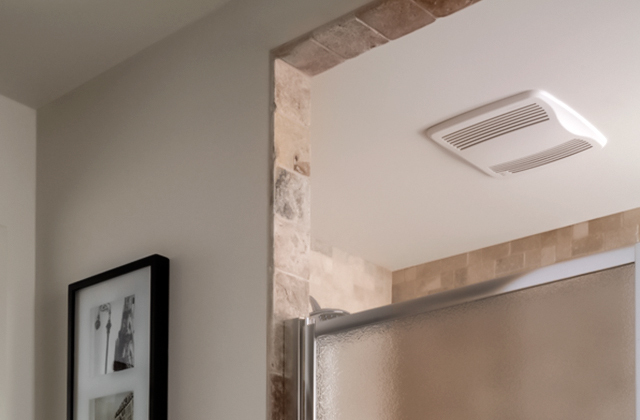 Although humidifiers might not seem like the most necessary device for a home, the lack of humidity, as well as an excess of it, can really cause some problems. The results will be particularly bad for people with skin issues or asthma. But how could something as minor and literally invisible as the humidity level cause so much trouble? Well, let’s take a close look at what humidity can do to you and your home. Those who have a lot of wooden surfaces or objects in their homes would do well to buy a humidifier as soon as possible. That’s because wood tends to absorb any excess moisture in the air, which might be good in forests where trees need nourishment but poses a problem for houses. If you’ve ever had trouble opening your bathroom door due to it getting stuck then you’ve faced humidity-soaked wood already. As the material soaks up moisture, it expands and this leads door frames to block your way and small objects to crack or lose their shape. It’s a pretty obvious one but still bears mentioning. If metal surfaces in your home are constantly unpleasantly moist or even beginning to rust, your humidity levels are far beyond where they should be. Though rust is often prevented via special coatings and more, it’s best to just keep humidity reasonable instead of proofing your home in an endless battle against it. Though the title might make it seem like we’re talking about something pleasant, we’re actually referring to how easy mites and mould breed in high humidity. That’s the reason why bathrooms must have ventilation systems and why homes with excessive humidity levels often develop a certain unpleasant odour. If you want your home to smell nice and have nothing living in it except for your family, you’d better keep that humidity in check. Now, we’ve surveyed what high humidity can do. But that doesn’t mean excessively dry air is much better. What problems that side of the spectrum cause? Well, how about dry throat, coughing, and fragile hair strands. And that’s not all as low humidity is one of the top causes of skin conditions as well as chapped lips. Those who give a lot of attention to their looks still manage to forget about this, which leads to people sinking money into skin care products when all they need is a humidifier. It’s no secret that the desired level of humidity lies between 40 and 60 percent depending on your skin type, time of the year, and a few other factors. However, that’s not always easy to maintain and many people have been asking if you can go a bit askew from this level and how dire the consequences would be. While a 5 percent decrease might not seem like much of an issue, even going down to 30 or up to 70 percent will certainly wreak havoc on your body and your belongings. If you don’t have access to a humidifier, whether because yours is broken or still hasn’t arrived, it might help to keep your windows open, burn candles, or at least run a fan to keep the air circulating in the room. Q: How often should I refill my humidifier? A: It depends on how much water the tank can hold. The more capacity it has the longer it will work. But most of the humidifiers should be refilled once every 10 or 20 hours if you are going to use them all day long. Q: Do humidifiers work loudly? A: It depends. Those humidifiers with ultrasonic technology provide very quiet work. Actually, they are the quietest, since they produce ultrasonic waves at a very high frequency which we cannot hear. Humidifiers without such technology are slightly louder but not that much. You still will be able to sleep or work and don’t get distracted by the noise. 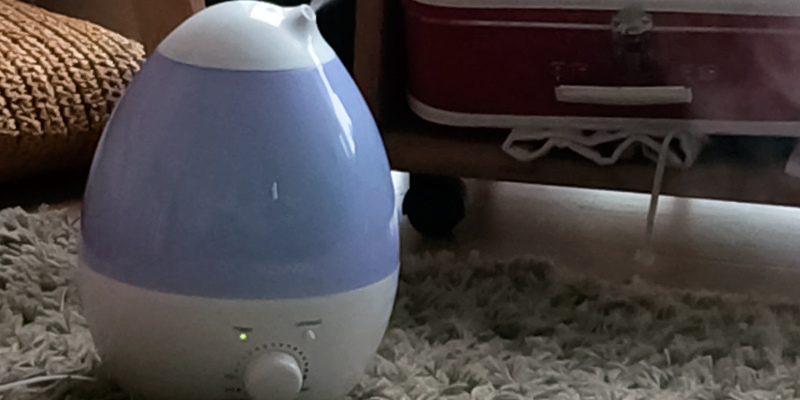 Q: Can I add essential oils to a humidifier? A: You can add them only if a humidifier has a special pad for oils. Learn the information before buying a device. 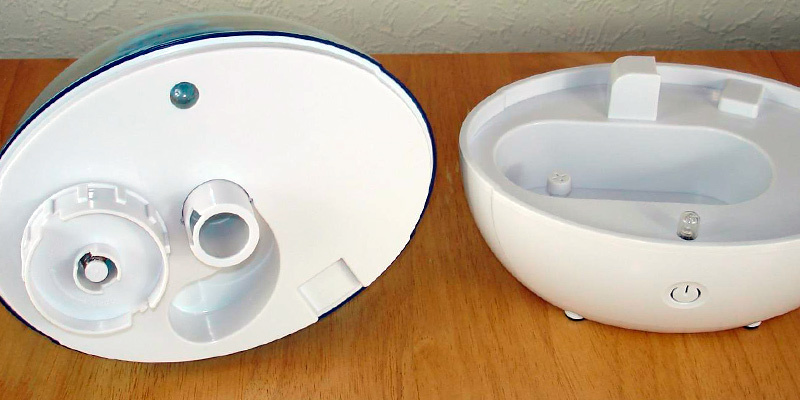 However, if your humidifier doesn’t have a pad, we don’t recommend adding an essential oil directly into the water tank, as it won’t really give you scented mist but might damage its parts. 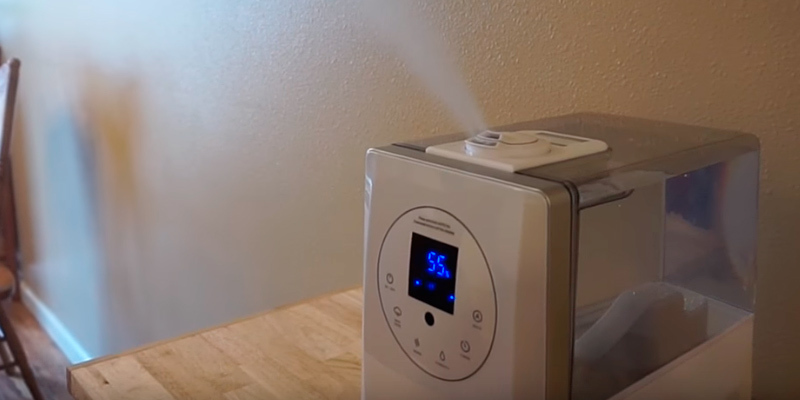 Q: Does a humidifier come with essential oils? A: No. You will have to buy them separately. Q: Are a vaporizer and a humidifier the same? A: They have the same purpose but different working principles. A vaporizer heats water to get hot mist, whereas a humidifier uses fans that create cool mist. Therefore, a cool mist is safe for a nursery, since it eliminates any burn risks. Q: What humidity level should I maintain? A: In general it should be between 30-50%. If the level is below 30%, it can provoke spread of flue gems in the air. Whereas, if you setup humidity level over 50% it can provoke mould growth. Q: What will happen if my humidifier runs out of water? A: Nothing, as all humidifiers have an automatic shut-off which gets activated when the water runs low. Q: Can I add salt to any humidifier? A: On no account add salt to any humidifier. Salt can reduce its lifespan, clog filters and deteriorate its working process. Q: Why do I need a humidifier if I can air my room? A: The humidity level from outside is not enough to moisten a room. Cold air can’t hold moisture well, whereas heated air can hold a low percentage of relative humidity. Therefore, dry air in the room needs more humidity level. 1. Steph Simpson How to Choose the Best Humidifier for Your Space, Reader's Digest. 2. Humidifier, Wikipedia. November 3, 2016. 3. 8 Easy Steps To Choosing A Humidifier, Streetdirectory.com. 4. Jill Elaine Hughes 4 Easy Steps to Finding the Best Type of Humidifier for Your Home, Trusted Сhoice. April 27, 2015.